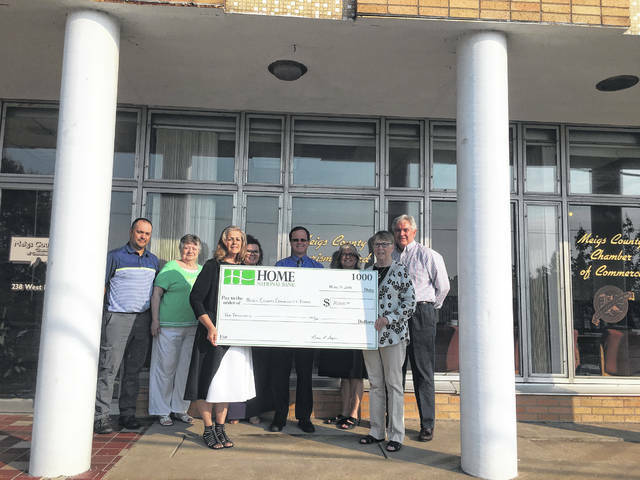 The $10,000 donation provided by Home National Bank will support the Meigs County Community Foundation’s Endow 200 campaign. POMEROY — Appalachian Ohio has a strong sense of community and community members coming together. On Thursday, residents were reminded just how strong that sense of community is in Meigs County when Home National Bank presented a $10,000 check to the Meigs County Community Fund’s (MCCF) Endow 200 campaign. At last MCCF meeting, the Home National Bank Board approved a $10,000 contribution to Meigs County Community Fund’s Endow 200 campaign, which was a campaign launched as a way to not only build that strong sense of community, but to celebrate the community and the people within it. Endow 200 will celebrate Meigs County’s 200th birthday. The campaign invites those who hold Meigs County close to their hearts to give 200 gifts of $3,000 each, with those gifts payable over five years. These dollars will be placed in a permanent endowment fund which will grow over time to allow MCCF to make grants to support the community for years to come. On Thursday morning, MCCF was presented with a check of $10,000 for Endow 200 at the Meigs County Chamber of Commerce. Home National Bank President Roma Sayre presented the check to Jennifer Sheets, president of the Meigs County Community Fund committee and director of Home National Bank. The Endowment 200 campaign is a part of the Meigs County Community Fund, a local community fund of the Foundation for Appalachian Ohio (FAO). The Meigs County Community Fund was created in 2011 to increase and advance philanthropic activities in Meigs County. It helps everyone give back to the Meigs County community. Gifts to the Meigs County Community and the Endow 200 campaign are tax deductible and can be made in many ways, including cash, bequests, and life insurance. Donations can be made online at www.AppalachianOhio.org by designating either fund when donating. To mail your donation, please designate the fund and mail to the Foundation for Appalachian Ohio, PO Box 456, Nelsonville, OH 45764. To learn more about the Meigs County Community Fund and learn how to support the community through Endow 200, please visit www.AppalachianOhio.org or call 740-753-1111.
https://www.mydailytribune.com/wp-content/uploads/sites/42/2018/06/web1_0603.HNB_.jpgThe $10,000 donation provided by Home National Bank will support the Meigs County Community Foundation’s Endow 200 campaign.